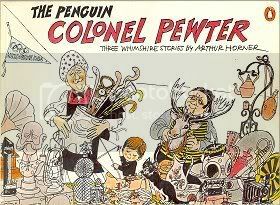 Something I've been meaning to do for a while was to put up a page about Arthur Horner's marvellous, but sadly rather forgotten, comic strip, Colonel Pewter. While I was off I had a chance to finally collect some information and put a Colonel Pewter page together: this post is just an extract from there. When I was growing up, I remember my father talking about a strip that he'd enjoyed some years ago in The Age newspaper, Colonel Pewter. He talked about various of the characters, including Glub, Colonel Pewter's Neanderthal butler, who Pewter dug out of his grounds where he'd been quick-frozen in Upper Palaeolithic times, and Pewter's great-nephew Martin. A year or two later, The Age started reprinting the Colonel Pewter series where Glub runs in the Olympic Games, I think to coincide with the Moscow Olympic Games in 1980. Not only that, but Arthur Horner, the mysterious man behind this fantastic strip, suddenly re-emerged with the satirical Uriel Report, about an angel observing modern events, and many additional political cartoons. There have been three compilations of Colonel Pewter stories and they're a good starting point for anyone interested in finding out more, though they don't begin to cover these myriad extraordinary adventures. When I first started reading Colonel Pewter, it seemed to me these tales - and in some ways, his character - were linked to Lord Dunsany's eccentric (also sadly forgotten) short story character, Jorkens - always able to spin stories that began in the commonplace and went somewhere else altogether. In a sense, I feel that Daniel Reed's current Australian comic, The Crumpleton Experiments continues this tradition - albeit in a much darker form - with Professor Crumpleton being a British eccentric with much in common with both Pewter and Jorkens. As wild adventure yarns, they're also akin to Carl Barks' masterful, consistently amazing and engaging Donald Duck/Uncle Scrooge stories, or Herge's Tintin (though the latter is certainly far more grounded in reality). Like these artists, Horner had a seemingly limitless imagination and amazing dexterity of vision and technique in the comics medium. The most marvellous aspect of the stories for me - apart from the fact that the material was perfect for comic strip presentation - was the way it managed to present stories that were at once continuing adventure strips and also funny on a daily basis. The stories themselves were centred always around well-rendered characters, who were believable, however bizarre and wild the adventures became. Of course, some of the attitudes (as with some Barks material) reflect the times, but they still hold up remarkably well. The Penguin collection is an ideal place to start. I'd be interested in hearing from Colonel Pewter fans, so please feel free to email me, sign my Guestbook or add Comments here. I remember Colonel Pewter and Horner's other editorial cartoons. Also enjoyed Frank Dickens' Bristow, the round-headed moustached quintessential civil servant ... and in a completely different style, a bizarre cartoon series called In and Out of Society which featured people who were, as I recall, drawn from almost just one flowing line. No speech bubble, just a fine line coming out of their heads. Thanks, Joe, I'm very pleased to hear someone remembers Colonel Pewter. I've been working through some of the older series - all very enjoyable reading - and I might add a few odds and ends to the page later. Incredibly, Bristow is still going and still as relevant to dull office life as ever! Soon after we were first married, my husband began cutting out Colonel Pewter strips, putting each set in a envelope, of which I now have 36. I am missing sets 2-5; set 14; sets 24-35; and I end at set 53. Since he died, I have been enjoying re-reading them, but wanting so much to share them with friends. Unfortunately the cuttings wouldn't last long if I did. How can I preserve them? I'm pleased to hear you're looking after your "Colonel Pewter" collection! Something recommended by many scrapbook people and collectors of newspaper strips is a product called "Archival Mist," that can be sprayed onto newsprint to prevent further acidification and decay. As an owner of a number of sets of yellowing CP series, I should get some, but it is expensive! There is a semiofficial page now at: Colonel Pewter where some series are visible, but all of them can be seen if you join Colonel Pewter Yahoo Group and request a password. If you don't want to join but would like access, please email me and I'll refer you on. These online stories aren't entirely complete, but it's an ongoing project and is now close thanks to the scanning efforts of some of the group members. Of course, we'd love to get the CP stories back into print somehow, but that's a huge project and might need access to the originals (if the aim was best quality reproduction).